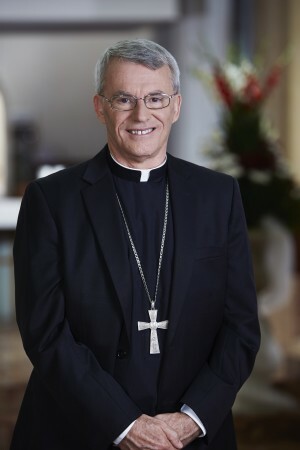 Archbishop Timothy Costelloe SDB was born in Melbourne on 3 February 1954, the second son of Francis John (Jack) and Carmel Tasma Costelloe (nee Roadknight). He was educated at St Peter’s Parish Primary School, East Bentleigh and at Salesian College, Chadstone, from where he matriculated in 1971. After several positions working in industry, he began his studies in a teacher training course at Christ College in Melbourne, which he interrupted in 1977 to join the Salesians of Don Bosco, an international organisation of Catholic priests and brothers dedicated to the service of the young, especially the disadvantaged and marginalised. He made his first profession as a Salesian on 31 January 1978 and graduated from Christ College at the end of that year. In 1985, he made his Final Profession as a Salesian of Don Bosco and was ordained to the priesthood by Archbishop Sir Frank Little on 25 October 1986. After three years as Religious Education Coordinator at Salesian College, Chadstone, he was transferred to Rome where he completed a Licentiate in Sacred Theology at the Salesian Pontifical University in 1991. Upon returning to Melbourne, he began lecturing in Systematic Theology at Catholic Theological College in Melbourne and worked in the area of the formation of young Salesians. In 1996, he was transferred to Perth where he was appointed parish priest of St Joachim’s Parish, Victoria Park, and lecturer in theology at the University of Notre Dame Australia, Fremantle. He completed his doctorate in theology from the Melbourne College of Divinity at this time. In 1998, he attended the Synod for Oceania in Rome as the theological adviser of the then Archbishop of Perth, his predecessor, the Most Reverend Barry James Hickey. Returning to Melbourne in mid-1999, he was appointed as Rector of the Salesian formation community in 2000 and resumed teaching commitments at Catholic Theological College. In addition to these duties, he was appointed as parish priest of St John the Baptist Parish, Clifton Hill, in 2006 and as parish priest of the adjoining parish of St Joseph’s, Collingwood in January 2007. He was a member of the Provincial Council of the Salesians from 2002 to 2007, Provincial Delegate for Formation in the Australian Province from 2003-2007, and was appointed as Regional Delegate for Formation for the East Asia-Oceania Salesian region in 2006. Archbishop Costelloe was appointed Titular Bishop of Clonard and Auxiliary Bishop of Melbourne on 30 April 2007 and ordained a bishop on 15 June 2007. As an auxiliary bishop in Melbourne, Archbishop Costelloe was given responsibility for the northern region of the Archdiocese. He was made Episcopal Vicar for Tertiary Education, Chair of the Catholic Education Commission of Victoria, Chair of the Mannix College Council, Chair of the Steering Committee for the Catholic Leadership Centre, Chair of the Advisory Board of the Archbishop’s Office for Evangelisation and the Archbishop’s delegate for Youth Ministry in the Archdiocese of Melbourne. He was also an Adjunct Professor at the Australian Catholic University. On 20 February 2012, Pope Benedict XVI appointed Archbishop Costelloe as the ninth Bishop and sixth Archbishop of Perth. He was solemnly installed as Archbishop of Perth on 21 March 2012. In the Australian Catholic Bishops Conference, Archbishop Costelloe is a member of the Permanent Committee, the Bishops Commission for Doctrine and Morals and the Bishops Commission for Catholic Education.